Will Coke's new calorie-conscious packaging change the grocery shopping experience forever? The obesity epidemic has brought watching what we eat to the forefront of our lives. High schools across the country have begun to retake control of school cafeterias, banning greasy burgers and soft drinks and serving up only healthy options to students. Fast food restaurants in New York are mandated to post the calorie counts of their offerings for all to see, while those in San Francisco aren't allowed to associate "Happy Meal" toys with unhealthy meals. A current series of articles from The Globe and Mail questions how much we really know about where our food comes from and what goes in it. But other than new "Lighter" and "Lower-sodium" SKUs, how much has our new calorie-consciousness affected the grocery store shelf? Not much. That is, until now. 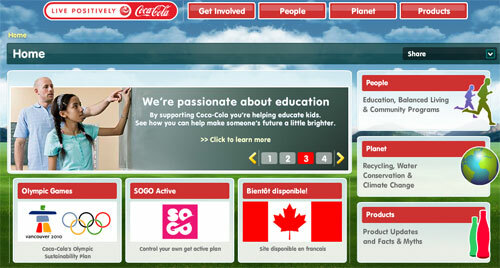 This week Coca-Cola began its new, health-related "Live Positively" campaign. 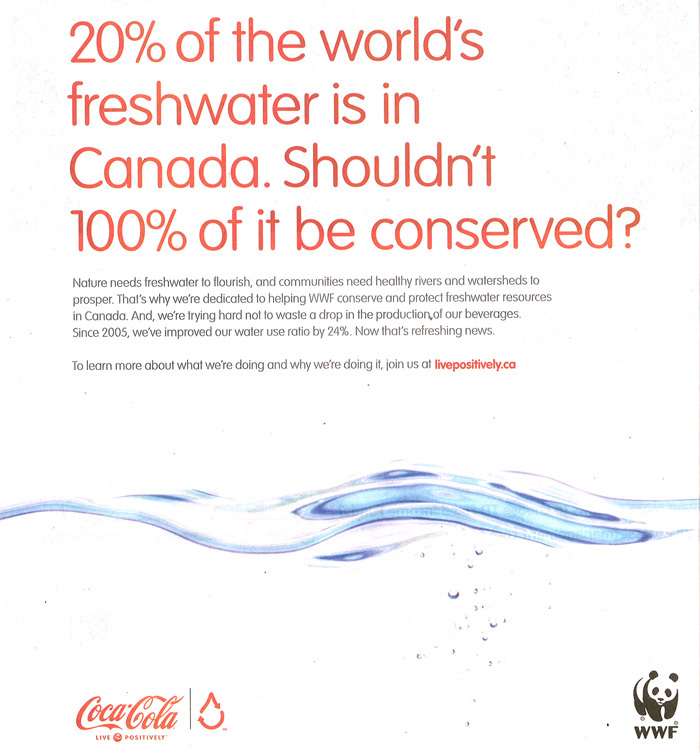 A second set of ads focuses on the environmental side of Coke's efforts to make the planet a more positive place to live. 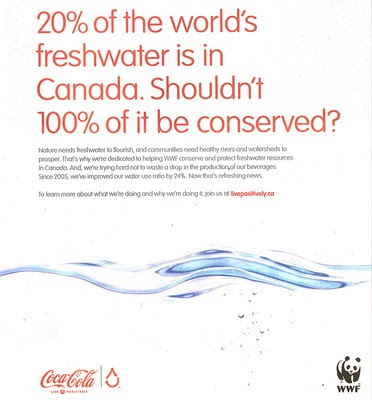 One execution speaks to the topic of freshwater conservation, and outline's how Coke's partnership with the World Wildlife Fund is helping to protect freshwater resources across Canada. The copy also highlights what the company is doing to conserve water internally: "Since 2005, we've improved our water use ratio by 24%. Now that's refreshing news." The second execution in the set focuses on energy efficiency. 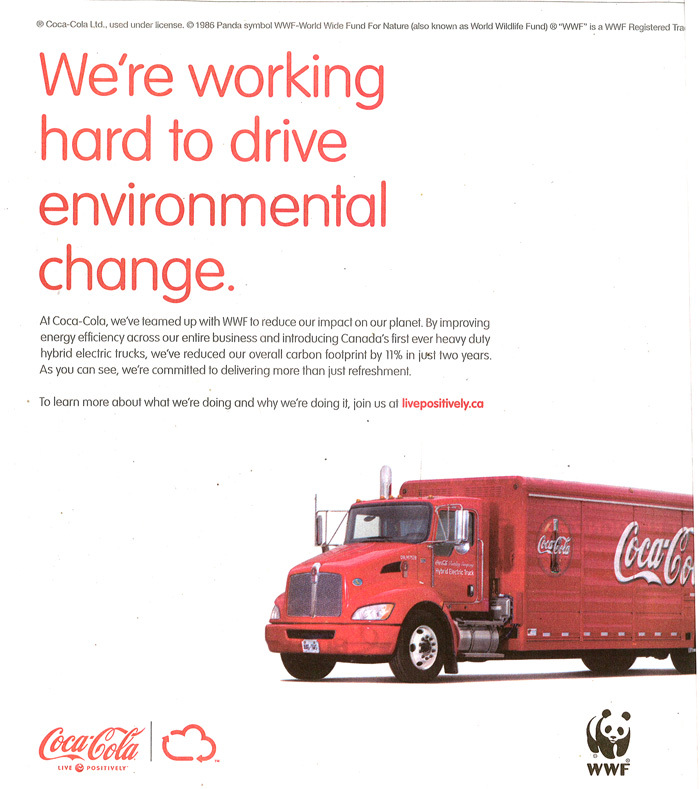 The copy once again calls out both Coke's partnership with WWF and what the company is doing to become more efficient itself: "By improving energy efficiency across our entire business and introducing Canada's first-ever heavy duty hybrid electric trucks, we've reduced our overall carbon footprint by 11% in just two years. As you can see, we're committed to delivering more than just refreshment." All of the ads drive to LivePositively.ca, a Coke's corporate social responsibility microsite designed to help people become more active. There you have it. 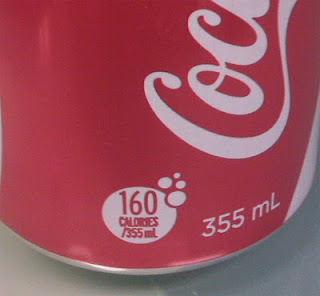 A 355 mL can of Coke is 160 calories. Who knew? But do you know what the strangest thing was? I actually did not feel bad about drinking it. The knowledge of how many calories was in what I was drinking didn't make me shun it, rather it made me feel empowered that I was making an informed decision. I knew what I drinking, which allowed me to manage what I ate and drank for the rest of the day accordingly. Just like Coke says, it helped me make a choice. That's when it hit me: just like energy companies now openly admitting that oil and gas aren't the best resources for us to depend on in the long-term, Cokes openness and transparency about the impact of its product on my health helped rather than hurt my opinion of the brand. 1) Women know how many calories are in pop, they still drink it. I don't understand the objective they are trying to achieve. 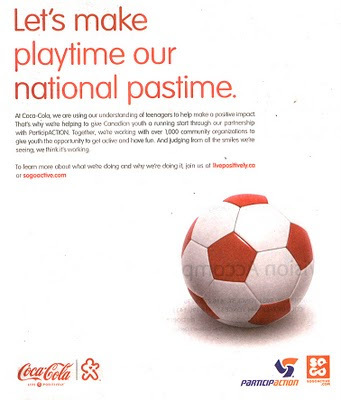 2) This campaign of positive feelings/getting back to basics is frighteningly similar to Pepsi's campaign as well as a million other brands. Not ownable at all. I give it a year at best before they go back to the Happiness Factory. That may be true, but the objective seems to be to *appear* to be more accountable to people's health by taking the lead on the calorie issue. I don't think it's meant to replace "Open Happiness" or "The Happiness Factory"... It's like they're saying, "Hey, we're not trying to pull the wool over your eyes - look at us, we're being transparent about what we are." Who wouldn't admire that? 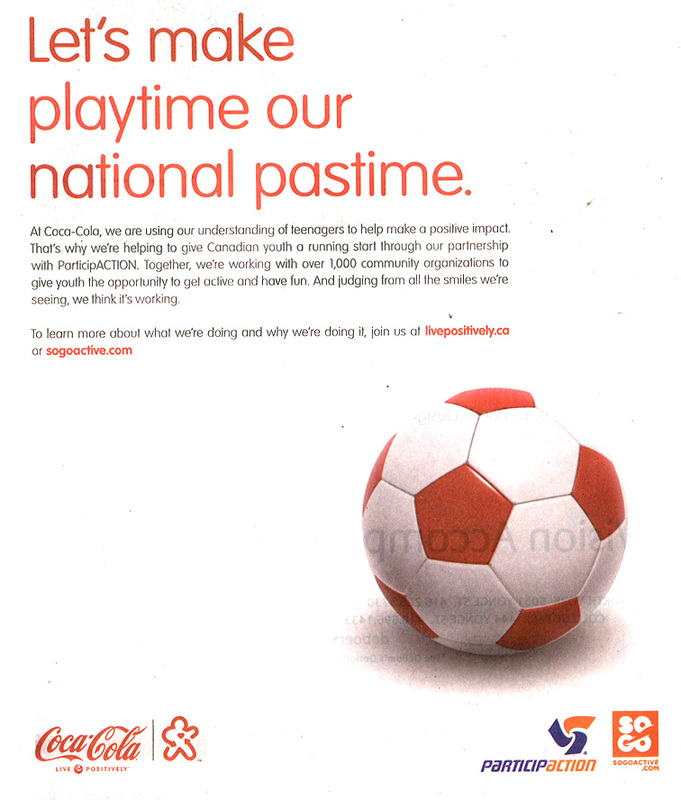 And Coke has always played in the "happiness" space, haven't they? Pepsi is the brand that seems to have lost their "challenger" attitude and mimicked Coke in their communications with the "Joy" campaign. Then again, positivity is what people are looking for in this uncertain economic climate... why not give the people what they want? PS: I miss our fights. 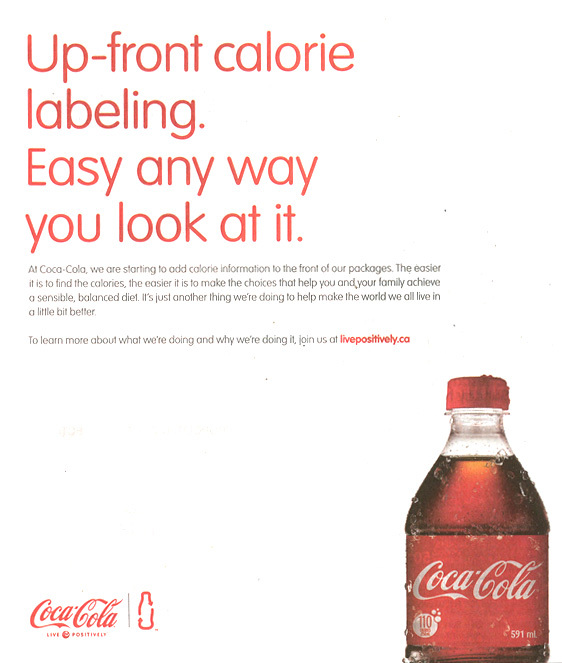 The openness by Coke reflects a step towards reaching out to their customer and like you said, making them feel empowered. 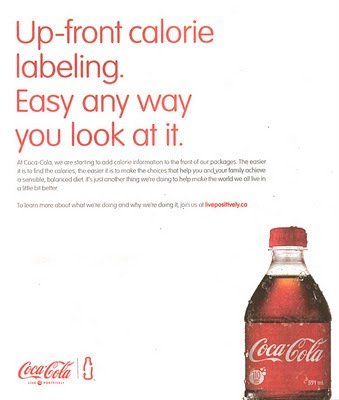 In a time when there a seed of doubt planted in everyone's mind about the ethics of marketing, I think Coke has done a great job at giving more information to the customer - and taken the risk of putting something as tricky as calories in big and bold. Ps: This is a beautifully written piece!